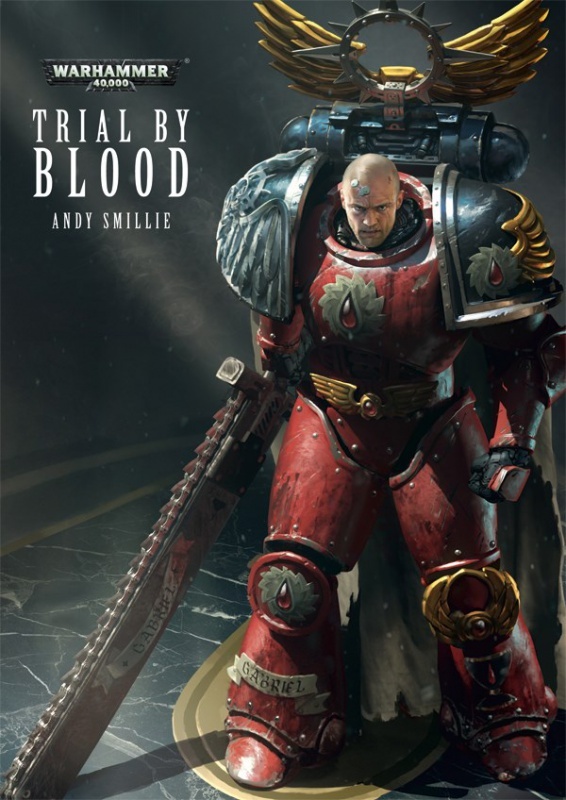 Le 14 Novembre 2014 sort le recueil Trial by Blood d'Andy Smillie. 200 pages sur les Flesh Tearers pour 20 €. Gabriel Seth est jugé pour sa vie, et pour l'existence même de son chapitre. Les Flesh Tearers, descendants de Sanguinius et ​​nobles cousins des Blood Angels, sont accusés de déviance et de brutalité au-delà de ce qui peut être toléré. Alors que Seth raconte son histoire de la défence de l'Imperium, ses juges - les Maîtres des autres Chapitres successeurs des Blood Angels- doivent décider du sort des Flesh Tearers. Novembre 2014 • ISBN 9781849709286 • Illustration par ? dommage que ce soit juste un ersatz de fig, et pas un "vrai" personnage. 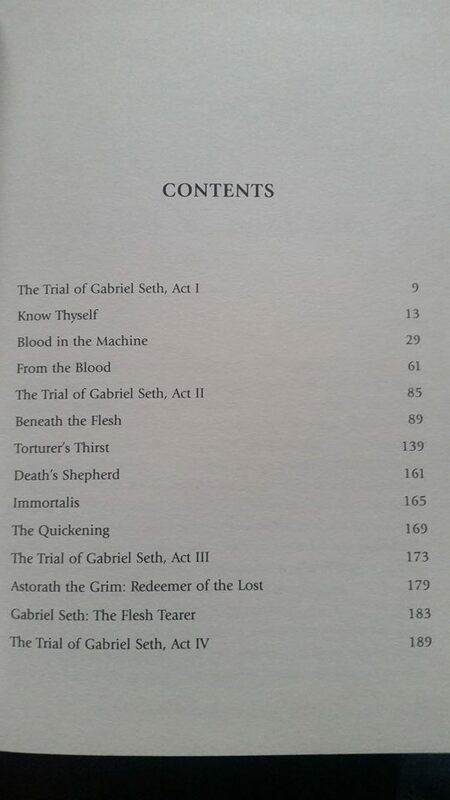 Gabriel Seth prepared himself for death, and stepped forwards. 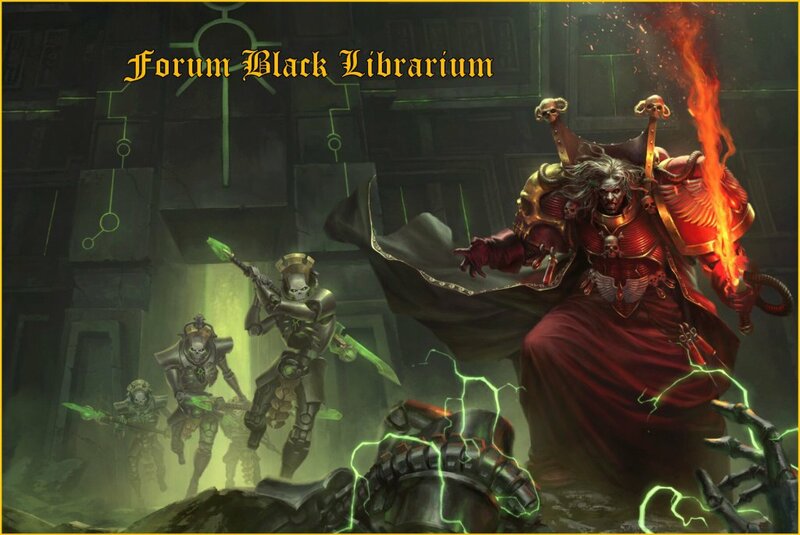 The Chapter Master of the Flesh Tearers entered the Forum Judicium and took his place at its centre. Shrouded in the depths of Baal, the chamber had remained unchanged from the day it had been carved into the rock. A vast elliptical space, it was reminiscent of the grand amphitheatres of ancient Terra. Towering rows of superimposed arcades formed the bulk of the structure, with each of the arches supported by a pair of Ionic columns. Angled buttresses carved in the likeness of Sanguinius provided further support and served as a reminder that it was his strength, his blood, upon which all undertakings were built. Higher up, held suspended in the space below the ceiling, a golden statue of the Emperor gazed down in silent observation. Standing beneath each of the arches was a Chapter Master. Each was a son of Sanguinius charged with commanding a Chapter of the Blood. A sea of red armour cast in every shade and hue, some rich like fresh-spilled blood, others ruby or swept through with crimson. Still others were clad in darkened scabs, the colour of scorched blood or the black of the curse. Seth cast his gaze over the assembled Chapter Masters, and found no friends among them. Their jaws were set like iron and their eyes carried the threat of violence. Seth felt a grin tug at the corners of his mouth, amused by the challenge inherent in their damning stares. ‘I am not here for your help.’ He spat the word, his eyes narrowing to slits. Whether any of them would act as a brother and not as a juror remained to be seen. It was a rare and dangerous occurrence for so many Chapter Masters to gather in one location. Yet duty and blood demanded the risk be taken. The Judicium was no simple court. It existed only to arbitrate in the direst of circumstances. In such times the scions of Sanguinius were called upon to lend their voice to the shape of history, to stand and make a choice. More than once Seth had stood with the others, passing sentence on the future. A surge of guilt quickened his heart as he remembered the consequences of such occasions. Some decrees, some judgements when passed, were like the pulling of a trigger. They could not be undone. ‘I have come here in sacrifice alone.’ Seth upturned his eviscerator and planted it in the red rock of the ground. The weapon’s ragged teeth were caked in gore. A ripple of disapproving murmurs echoed around the chamber. ‘You are in no position to make demands, Gabriel.’ Dante was the first to answer. There was impatience in his tone but it carried neither threat nor aggression. Seth glared up at the lord of the Blood Angels. There were none who had embraced Sanguinius’s angelic legacy as fully as Dante. Resplendent in his golden armour, its ornate plates polished to a mirror sheen, he stood as a beacon of hope. A noble protector who would rise above the curse. Yet for all his skill as an orator, Seth knew it to be a facade. Of all the Chapter Masters, Dante alone was helmed. A gilded death mask obscured his face, at once cruel and beautiful. Seth released the breath he had been holding, easing the tension from his muscles. He both admired and pitied Dante. To be forced to hide his own rage behind such a mask would have driven Seth mad. That Dante endured it had always been reason enough for Seth to accept the Blood Angel as first among equals. ‘Dante is right.’ Castellan Zargo’s words were barbed with menace. ‘You will account for your deeds.’ The master of the Angels Encarmine thrust a finger at Seth. ‘You would threaten us?’ Zargo snarled. ‘Hypocrisy suits you ill, cousin.’ Seth’s quiet rage built in his throat. ‘Agreed. You have damned us all with your actions.’ Orloc, lord of the Blood Drinkers, spoke up in support. ‘Arrogance and bloodlust are your only gifts to this brotherhood,’ said Geron. Dante gestured to Techial. The Chapter Master of the Disciples of Blood approached an ornate lectern that sat just above the amphitheatre’s floor. Techial had been appointed Chronicler. It fell to him to recount Seth’s sins, to detail the actions that had brought the Flesh Tearer to such a juncture. ..haie. j'ai mal aux dents..
Alors Seth, c'est the eternal teenager qui va montrer à tous ces coincés de fils de sanguinius bien sappés ce que c'est que d'être honnête et de bien rager comme il faut dans ses jeans sales..? ..et c'est quoi ce mini-conclave? juste une intro-pretexte pour que Seth raconte TOUTES les autres eshort? que TOUS les autres Maîtres de chapitre se fassent peindre en sales hypocrites?? Dante qui cache sa rage derrière son masque mortuaire.. mais quelle imagination..
Mais quelle déchéance depuis sa nouvelle "Flesh of cretacia", ou c'est moi qui supporte plus que les auteurs BL soient aussi coincés de l'imaginaire quand il faut parler des Bloods au M41.. (soit "rebell-rebell twoâ-loà, rend-moi mon yop' ! , soit "nann, laissez-moi, j'ai la rage noire, c'est pas ma faute.." ).. c'est tout? Mais bon sang c'est tellement compliqué?? comment ils font les autres? à battle, dans la SF? dans les RPG? L'extrait donne vraiment envie de lire la suite ! Je ne sais pas ce que Gabriel a fait, mais en quelques phrases on est acquis a sa cause. Pareil pour l'illustration, j'ai flashé dessus direct ! - The Trial of Gabriel Seth, Act I. - The Trial of Gabriel Seth, Act II. - The Trial of Gabriel Seth, Act III. - The Trial of Gabriel Seth, Act IV. Ce qui représente 45 nouvelles pages sur 192, soit 23,43 %. Tu affabules donc avec tes "j'ai déjà lu 80 %" ! Mais qu'est-ce qu'ils ont fait ces pauvres Blood Angels pour se faire écrire comme ça!